Please note that the content of this book primarily consists of articles available from Wikipedia or other free sources online. 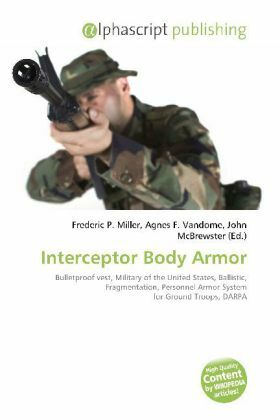 Interceptor Body Armor System is one of the latest modern body armor series fielded by the U.S. military. The Interceptor design is a modern and effective body armor/ballistic protective vest system, and it replaces the older fragmentation protective Personnel Armor System for Ground Troops body armor system, introduced for U.S. military use in the early 1980s. Materials for the Interceptor vest were developed by DARPA in the 1990s, and a contract for production was awarded to DHB Industries'' Point Blank Body Armor, Inc., by the U.S. Army Soldier Systems Center. As of early 2010, the Interceptor Body Armor System currently employs two main variants, the original Outer Tactical Vest, used with the Small Arms Protective Insert ballistic plates series; and the newer Improved Outer Tactical Vest, used with the Enhanced Small Arms Protective Inserts ballistic plate series.